The CB-12P classroom ceiling enclosure is designed for classrooms with projectors. 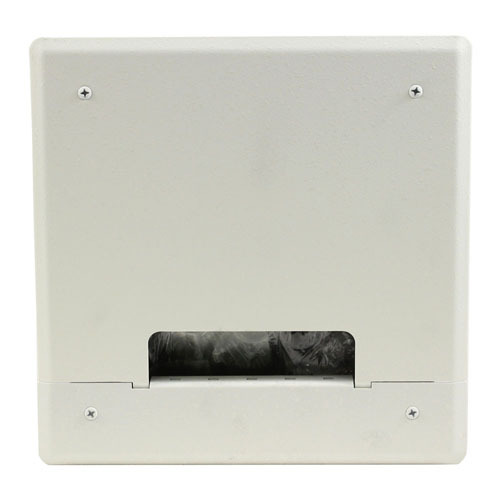 This 1'x2' enclosure drops into any standard drop ceiling installation and provides electrical connections, AV equipment installation and AV and data signal routing above the ceiling. 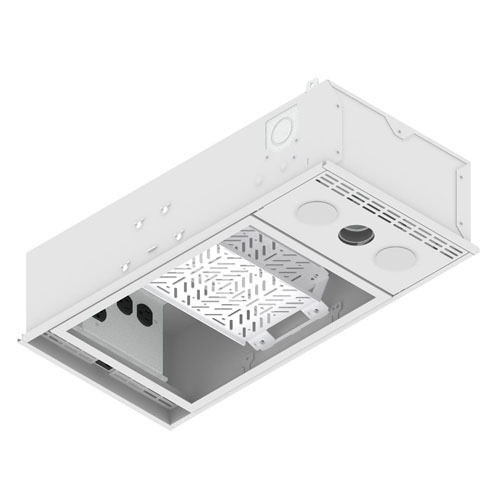 The ceiling enclosure has a projector receptacle facing the room, 3 additional un-switched receptacles inside the enclosure and brackets to mount two 1/2 rack pieces of equipment. The cover is a white trim ring, similar the ceiling grid, that holds a matching ceiling tile for a finished look. Purchased for a job and never used. New condition with all parts but some wear to the box. Shipping on this item is only $8 (U S addresses). 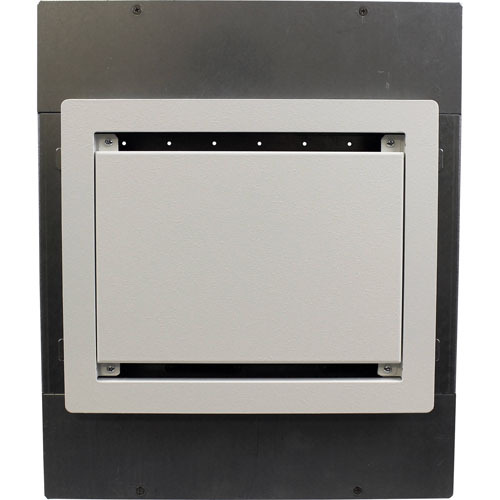 The largest of FSR's PWB Series wall boxes, the PWB-450-WHT mounts in a typical 4" deep wall between the studs in a standard 16" stud bay. The PWB-200 wall box is made for flat panel display installations. Rugged 16 gauge steel back box with 1/16" front cover. 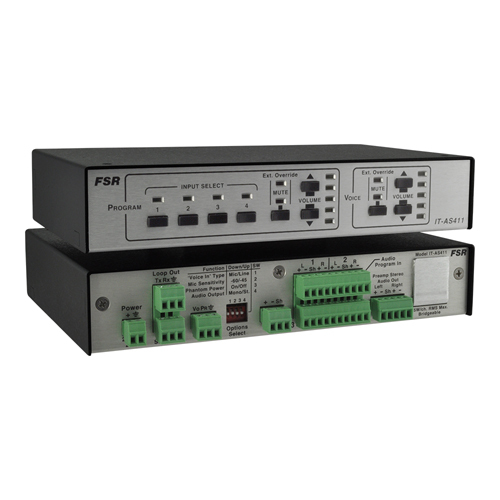 Compatible with FSR's Intelligent Plate Solutions(IPS) inserts. Can be installed in new or old work and the AC back box is included. Connectors are hidden behind an attractive white cover with multiple knockouts in a variety of sizes. UL listed. 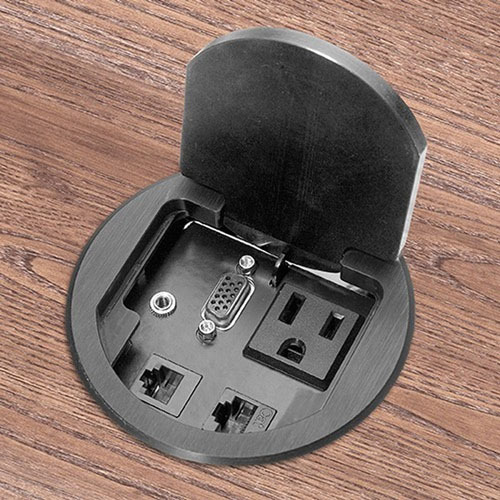 The T3-PC1 table box is made for technology connections in conference tables. Video, audio, network and phone connections all in a rugged metal housing cover piece. 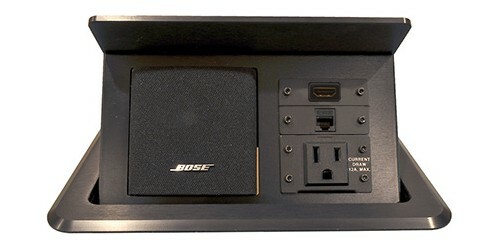 The TB-BOSE table box is a tilt top style table box designed specifically to contain a BOSE FreeSpace 3 surface-mount Satellite Cube speaker. The section to the right of the speaker is for up to 4 IPS insert plates. It has a black anodized finish. In the open position the speaker will be at approximately 35 degree angle from vertical. There is up to 4" of clearance behind the IPS plate surface. This unit does not include the speaker and connection panels shown in the photo. 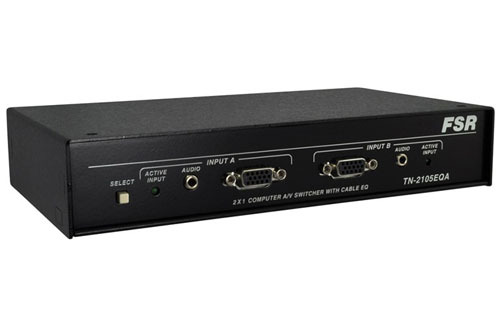 The IT-AS411 Series Audio Switchers are 4x1 audio switchers that have an extra mic/line level input for a voice lift system or direct microphone input. All models have four switched program audio inputs and an independent mic or line level input that is summed (mixed) with the selected active program audio. The 25SB adds an internal 25W stereo audio amplifier. The RGB-HV-2 is a 1x2 high bandwidth, high resolution RGBHV distribution amplifier that supports a variety of component signals. Designed for presentation and broadcast applications this unit offers independent EQ adjustment for each of the output channels. Purchased for a job and never used. New condition with power supply but no box. The CI-5UT Computer Video and Stereo Audio Interface is a unit designed to provide interfaces with computer video and audio applications. It features signal amplification and balanced audio output for noise-free presentations. This unit is ideal for use in boardrooms, educational settings, training rooms, staging and rental applications, conference centers, and houses of worship, among many other possibilities. Purchased for a job and never used. New condition but no power supply or box. 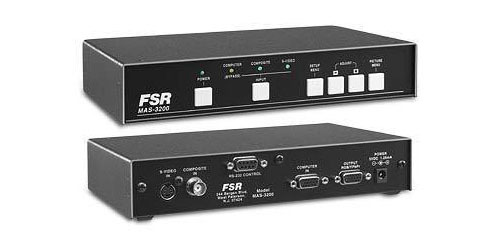 The MAS-3200 is a conversion device accepting analog composite or Y/C video; this unit upconverts to VGA type high resolution signals for display on multi-sync monitors or projectors. It also operates as a 3x1 switcher for multiple input applications. 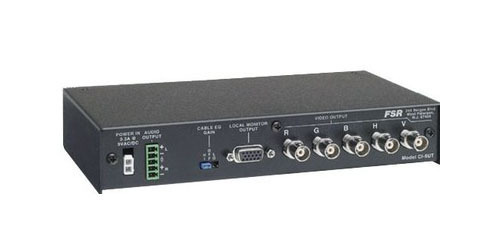 The TN-2105EQA is a computer audio/video switcher; it takes in 2 computer generated video signals along with unbalanced audio and switches to a HD-15 or 5 BNC video output with balanced audio. It features EQ adjustment and a compact size. The CDA-2EQA is a computer video stereo audio distribution amplifier; it features computer video and balanced or unbalanced stereo audio output. The video circuitry allows EQ adjustment in a compact metal housing. 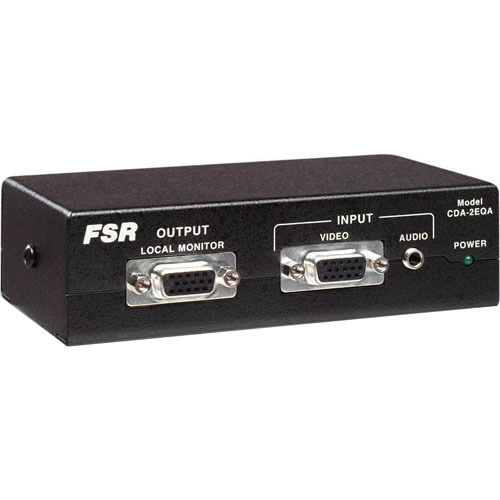 The PN-2101PC Pocket Navigator Video Switcher (Computer Video/VGA) from FSR is a versatile video switcher with an extra local monitor output designed to manage up to (2) computer VGA video signals. 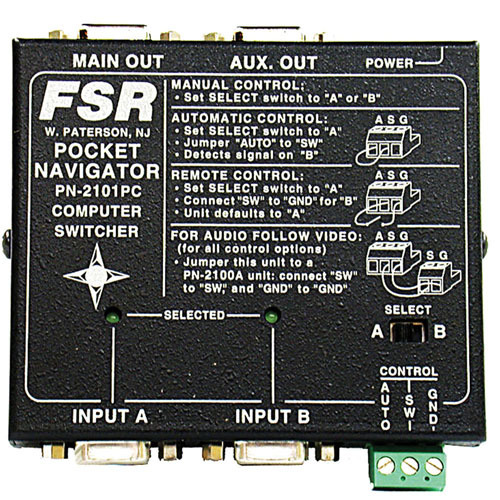 This A/B switcher features active circuitry and buffers all signals to offer the highest signal integrity possible. It also includes multiple control options through a built-in manual switch, remote control, automatic controls, or a push-button control panel. 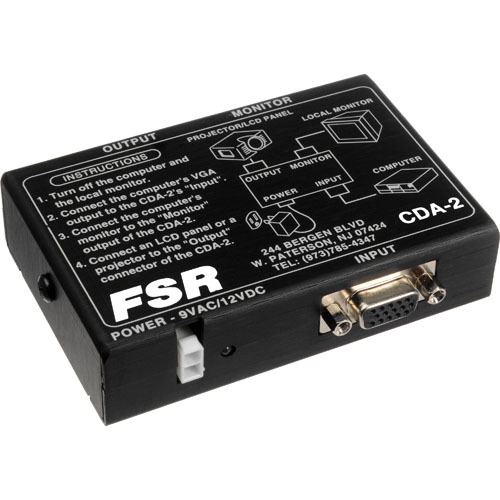 The FSR CDA-2 is a Computer Video Distribution Amplifier; it accepts a video signal up to XGA on an HD-15 connector and outputs two identical signals for local monitoring and presentation. 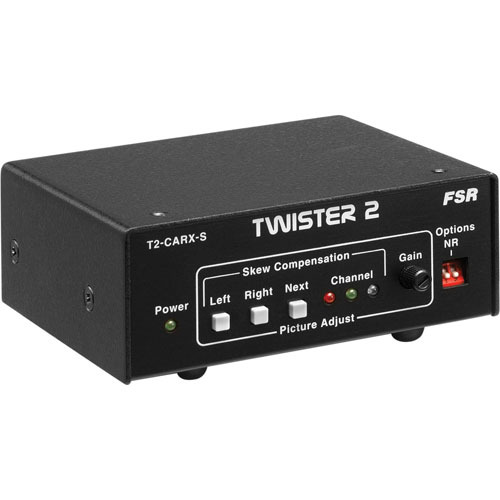 The T2-CARX-S AV Receiver forms part of FSR's Twister 2 audio/video Cat-5 transmission system. 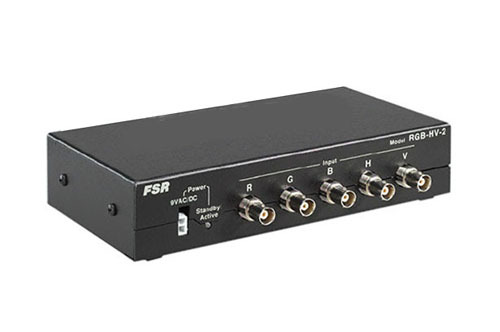 Combined with an optional T2-CATX transmitter, this receiver allows for long-distance transmission of high-resolution video and stereo audio using affordable, easily available Cat-5/5E/6 cable. 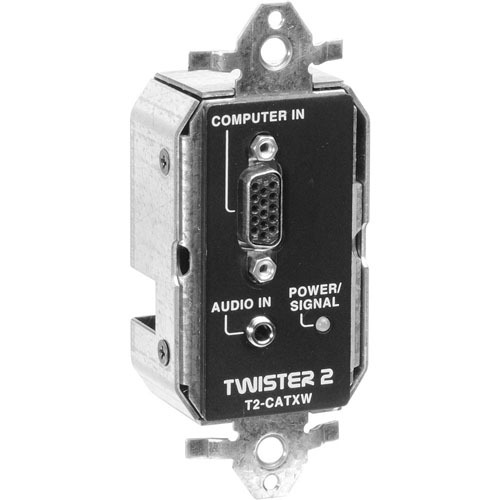 The T2-CATXW AV Transmitter forms part of FSR's Twister 2 audio/video Cat-5 transmission system. Combined with an optional T2-CARX receiver, this transmitter allows for long-distance transmission of high-resolution video and stereo audio using affordable, easily available Cat-5/5E/6 cable. Purchased for a job and never used. New condition but no box.